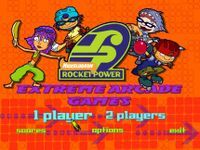 Rocket Power: Extreme Arcade Games is a 2001 video game designed for the PC by THQ and Sapient Corporation. It uses Bink Video and Miles Sound System technology. It is based on the Nickelodeon TV show Rocket Power. It consists of 4 mini-games, Hockey Shot (Otto), Rocket Pogo (Sam), Sandcastle Slam (Reggie) and Roller Rocketball (Twister). Each mini-game is hosted by a Rocket Power character. Roller Rocketball, however, must be unlocked by playing games. Source: Wikipedia, "Rocket Power: Extreme Arcade Games", available under the CC-BY-SA License.